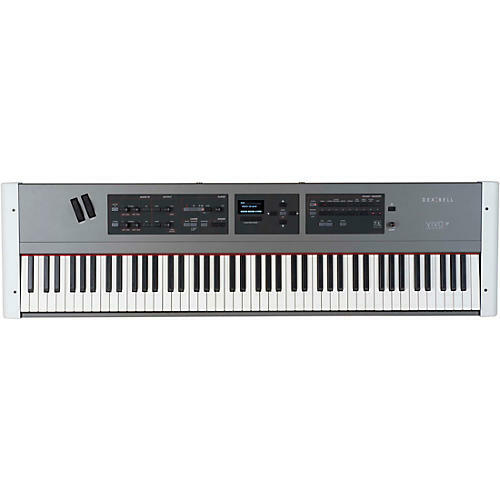 The DEXIBELL Stage Piano is available in 88-key and 73-key formats, the S7 and S3 respectively. Among its many attractive aspects is its radically clear and vibrant audio quality. It exceeds the current standard of 16-bit and 44.1 KHz with the use of higher definition 24-bit technology, both in its core waveforms and also in its digital to analog conversion. The 24-bit standard together with the 48 KHz sample rate has improved the frequency response and dynamic range of the S7 and S3 digital pianos. At the heart of the DEXIBELL piano lies a powerful Quad Core processor that manages 320 digital oscillators. This large number of oscillators allows for the simulation of all the elements that culminate together to model the T2L sound. This results in an unlimited polyphony, just like an acoustic piano. The increased polyphony used in Dexibell Pianos contributes to its uncanny simulation of the realistic responsiveness of a real piano. Throughout the range of DEXIBELL pianos, the recorded waveform length of each individual note is between three and 15 times higher than other competing instruments on the market. A low note on a DEXIBELL piano has an original waveform of 15 seconds. The current average is between one and five seconds. The result is astonishing realism and vitality of the harmonics through the evolution of the sound of held notes. The audio quality of the DEXIBELL is unquestionable but what is even more astonishing is the interaction the player feels with the instrument. Every subtle nuance is conveyed and channeled from the musician's hands. Output:	L/Mono R, 1/4 in.